A major research area in my lab is Bone Tissue Engineering. Our approach is to apply biomechanical engineering principles towards developing clinically-translatable functional outcome measures to assess the efficacy of novel treatments and tissue engineering approaches to repair massive segmental defects in long bone. Using a preclinical mouse model of femoral allograft reconstruction, we developed a novel quantitative and clinically-translatable measure of union via 3D-CT imaging, and for the first time reported direct correlations between the graft and host degree of union and the biomechanical properties of the reconstructed bone. The broader impact of this research lies is that it could have important applications in longitudinal preclinical and clinical evaluation of tissue engineering strategies for bone repair and grafting, which we are currently pursuing. 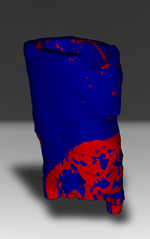 A surface rendering from a micro-CT image of a murine cortical bone callus has formed is colorized red using a novel image processing algorith. It allows for visualization and quantification of the degree of union of the bone graft with the host. While the lower end has significant osseointegration, a non-union is evident on the upper end. Anabolic effects of intermittent systemic injections of teriparatide (recombinant parathyroid hormone) on structural bone allografts are manifested by substantial improvements in the amount of callus bone formation and graft incorporation that resulted in improved union between the host and graft in our preclinical mouse model. More importantly, these improvements led to a 76% increase in the allograft Union Ratio (red areas), which significantly correlated with the fact that the allografts achieved greater strength and stiffness after only 6 weeks of healing.